Among the great violinists of the 20th century, Henryk Szeryng (1918-1988) was once regarded as a supreme master, but has now faded from memory. Szeryng�s fame is not comparable to that of Jascha Heifetz, David Oistrakh, Nathan Milstein or Yehudi Menuhin, although he was often mentioned along with them. There is no question that his performances set standards, the major record companies vied for his favour, and he was a popular guest at major orchestras throughout the world. In the great concertos by Beethoven and Brahms, he was considered an authority and, even today, he remains for Hilary Hahn a preeminent Bach interpreter. Henryk Szeryng performed in Germany regularly over the decades. In 1955 Szeryng played with the Sinfonieorchester des S�dwestfunks under the direction of the legendary conductor Hans Rosbaud. 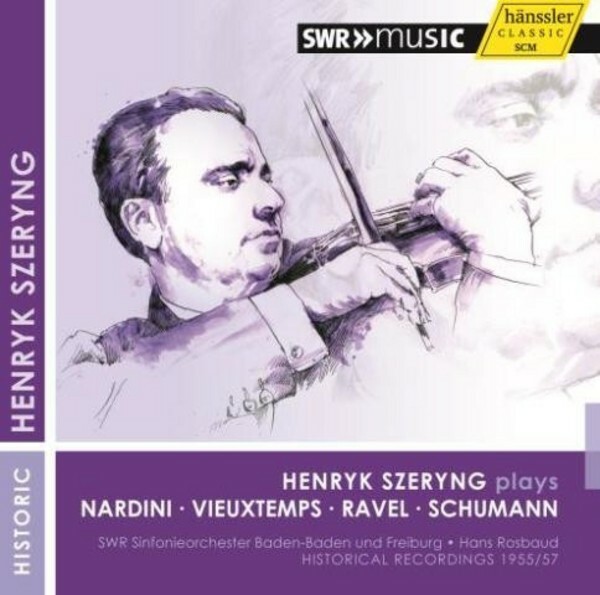 These live recordings of a Romantically-edited version of Nardini�s E Minor Concerto and the popular fourth concerto by Vieuxtemps were followed in March 1957 by studio recordings of Ravel's 'Tzigane' and Robert Schumann�s Violin Concerto. Szeryng was the first major violinist after Kulenkampff and Menuhin to recognize the value of this grandiose masterpiece and to it play publicly.